- Depending on availability and group size we Visit 4/5 boutique cellar doors usually including but not limited to Ernest Hill Wines ,Irongate Wines, Blueberry Estate, Calais Estate Wines, Ivanhoe Wines ,Drayton Family Wines ,Leogate Estate Wines, Macquariedale Organic wines. -Private cheese and chocolate tastings at local owned and operated stores. -Organic flavoured vodka schnapps and gins tastings. LUNCH options vary at your OWN expense! $25-$40pp with a drink included. 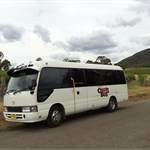 SPECIAL bus group menus available on board to pre order from $25pp one course with a wine or beer included -$40pp three course FEAST with a glass of wine to match. -All our guided cellar door selected tasting fees INCLUDED. (we may take your preferred cellar door and brewhouse beer sampling requests depending on group size and availability tasting fees may apply at YOUR own expense USUALLY redeamable on wine purchased. -Your credit card is for confirming the booking and ISN'T debited until the tour day IF NOT payed by cash. - If pick up or return is outside local vineyard area a small surcharge may apply depending what day, where from, and how many people in the group?? ?